A new exhibit featuring hundreds of items from the University of South Carolina’s special collections tells the story of the state’s fundamental role in the national Civil Rights Movement. 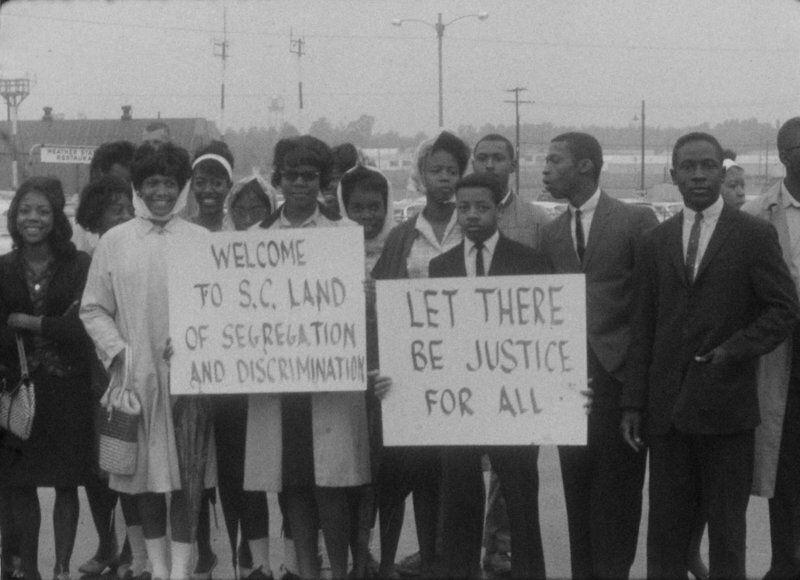 Opening February 7, Justice for All: South Carolina and the American Civil Rights Movement uses oral history recordings, film clips, photographs, postcards, diaries and manuscripts to highlight largely overlooked chapters in the history of the movement. Justice for All is the work of the Center for Civil Rights History and Research at the University of South Carolina, in partnership with the University of South Carolina Libraries and the College of Arts and Sciences. SC Humanities helped support this project with a Major Grant. Presented for the first time in one venue, the exhibit items fill 30 glass cases and utilize all the exhibit spaces in the Thomas Cooper Library and the Ernest F. Hollings Special Collections Library at the University of South Carolina. A visual narrative is also told through specially-designed vinyl window posters and elevator wraps placed throughout the library, as well as directional signs featuring the faces of noted civil rights activists. Visitors will see items from two dozen collections housed in University Libraries, including audio recordings of interviews with civil rights activists from the Office of Oral History, footage of demonstrations and press conferences from Moving Image Research Collections, and numerous photographs and documents from South Carolina Political Collections, Irvin Department of Rare Books and Special Collections, and South Caroliniana Library. Justice for All will be on exhibit through July 2019. Several public events will take place during that time, connecting the exhibit to significant anniversaries, such as the 50th anniversary of the Charleston Hospital Workers’ strike and the 90th anniversary of Dr. Martin Luther King, Jr.’s birth. Invited scholars and civil rights veterans will share their work and experiences through public talks, and a number of Open Gallery days will be offered, when the exhibit will be open for weekend viewing and guided tours. An event to launch the opening of the exhibit takes place February 7 in the Ernest F. Hollings Special Collections Library. Dr. Cleveland Sellers, a veteran civil rights activist, former Director of the USC African American Studies Program and former President of Voorhees College, is the keynote speaker. To RSVP for the opening, please visit this website. A digital Justice for All exhibit will also launch February 7. Legendary civil rights attorney, Fred Gray, who represented Rosa Parks and Martin Luther King, Jr. will speak at the University’s School of Law on February 21. Thursday, April 4 | 6:00 p.m.
Saturday, April 20 | 10:00 a.m. – 3:00 p.m.